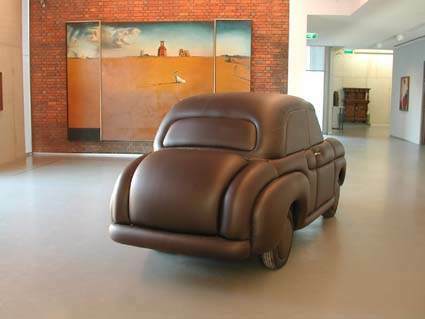 The Rotterdam artist Olaf Mooij (1958) has achieved particular fame with his car sculptures on display in public space. 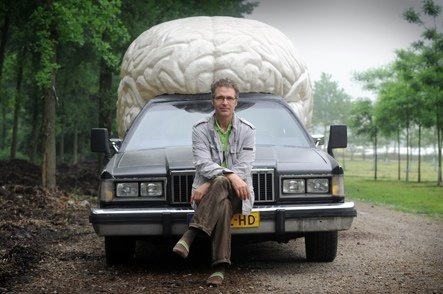 Almost everyone knows his Braincar, a car whose top has been transformed into a brainpan. 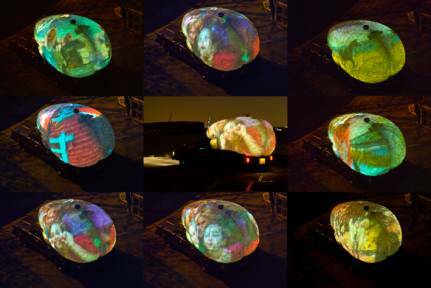 During the day, the car drives through a neighbourhood, city or street, and in the evening it dreams of its day through video projections on the matt white brain surface. Since the early nineties, Mooij has looked to the street as a stage for his work. 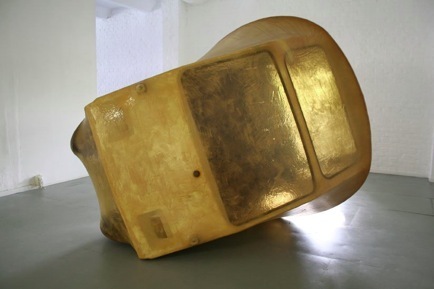 Typical of his generation, including artists like Joep van Lieshout and Jeroen Doorenweerd, was that they connected their work much more with the world outside the walls of the exhibition halls. 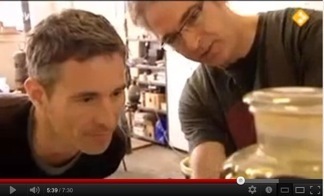 That often led to confusion: was this really visual art. 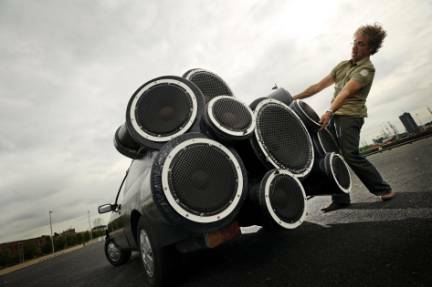 In 1999, Mooij was nominated for the Rotterdam Design Prize with his DJ Mobile: a converted Ford Sierra with a professional sound system, ten speakers and a DJ booth. But to the good viewer it was always clear; Mooij his work is firmly rooted in the sculptural tradition. At the basis of sculpture lies the artist his ability to suggest life in dead matter. Rodin his famous The Kiss is actually just a piece of rock, but we cannot see (or feel) anything other than a passionate embrace. 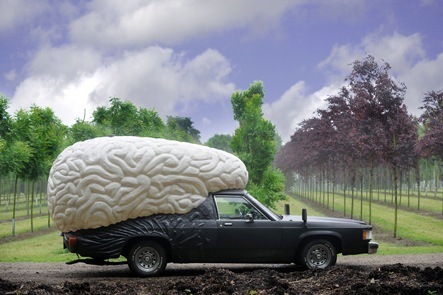 Olaf Mooij his cars are nothing more than bodywork, but he has transformed them into personalities, into living matter. 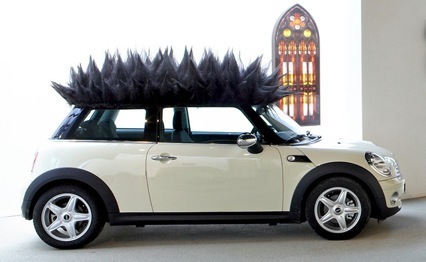 Through the addition of exaggerated hairstyles, hairpieces or the enlargement of parts, caricatural images materialize. The humorous images relativize the contemporary relationship of the human being to machines and the devices that surround him. The universal phenomenon of the love object is playfully ridiculed, as in the Chesterfield Car which looks as inviting as a real Chesterfield couch (2004, collection Museum Boijmans van Beuningen).In his recent series of works, which were almost entirely exhibited in TENT Rotterdam march 2009, Mooij appears to want to return to the absolute autonomy of the sculpture. His car images no longer have a functional use, but serve only as a reminder of the modes of transport. The works stand, lie, hang and lean in the exhibition space. They have been placed on the ground without a pedestal, and without their practical value they look very vulnerable. The skin, the surface of the car, is the focal point. 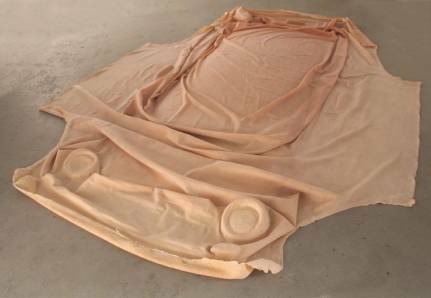 The skin of what once could have been an estate car lies folded on the ground. A Volkswagen form lies unstable on the floor, its surface covered with a black stone-like layer. The work presents itself as a fossil remnant of a distant past. A small car form is spanned by a yellowish membrane from which it appears to be breaking free; the suggestion of a birth is induced. In the play between form and meaning, between volume and surface, between symbolic function and functional use, Mooij seeks the exact point where they converge. End and beginning, before and after: this dead matter is biomorph, the resemblance of living beings. Mooij's recent sculptures have a strong tactile appearance; they invite you to touch them and, oh, why not, to love them.